Question 4 What is a scalar quantity? Question 5 What is a vector quantity? Question 6 Define uniform motion? Question 7 Define non-uniform motion? Question 8 A body is moving along a circular path of radius R.What will be the distance travelled and displacement of the body? Question 9 Under what conditions can a body travel a certain its resultant displacement be zero? a)What is the total distance travelled. b)What is the resultant displacement. A body is said to be in motion when its position changes continuously with respect to a stationary object. Man,animal,vehicles,birds,fishes etc are not stationary. Distance is the actual length of the path covered by a moving body irrespective of the direction in which it travels.It has only magnitude.It can never be zero. Displacement is the shortest distance between initial and final position of body along with direction.It has magnitude as well direction.It can be zero if initial and final position is same. A physical quantity which has only magnitude and no direction is called as scalar quantity. A physical quantity which has magnitude as well as direction is called vector quantity. If we take a round trip and reaches back at same point then distance will be 2 π r and displacement will be zero. Whenever a body travels along a zig zag path,the final displacement is obtained by joining the starting point and finishing point of body by a straight line. A body has uniform motion if it travels equal distance in equal interval of time,no matter how small these time intervals may be. 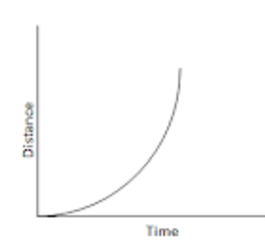 Distance-time graph for uniform motion is a straight line. A body has non-uniform motion if it travels unequal distance in equal intervals of time. 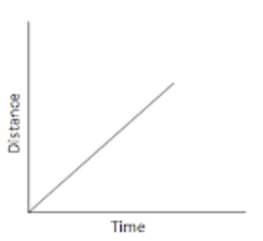 Distance time graph will be a curved line.